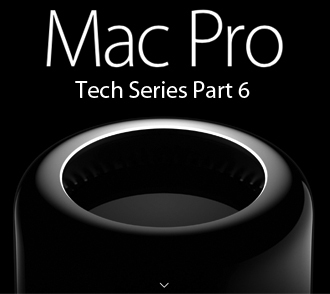 Mac Pro 2013 Tech Series Part 6: Your Questions Answered - Sewelltech, Inc.
Today in Part 6 of a 6 part series we will answer your questions on the new Mac Pro 2013. Although the Mac Pro 2013 is designed to operate in an upright position, you can also use it on its side. The Mac Pro 2013 has a fan system capable of cooling the computer in a vertical or horizontal orientation as long as you follow these guidelines. Provide enough space at each end of the computer for unrestricted airflow into the base and out the exhaust at the top. Make sure that the air intake and exhaust ports are not covered. When using multiple Mac Pro 2013 computers, do not direct the exhaust at the top of one Mac Pro towards the intake of another system. Place the computers side by side with a gap of at least several inches between them. When on its side, secure the Mac Pro 2013 to be sure that it doesn’t roll. Place the computer on a protective surface that will not scratch or damage the enclosure. Note: The Apple Limited Warranty does not cover cosmetic damage to the enclosure. Orient the computer so that the Input/Output (I/O) panel remains accessible during use. Make sure that the memory you plan to use is compatible with your system. The Mac Pro supports both unbuffered UDIMMs and registered RDIMMs, but it is important not to mix these types of memory. DIMMs which are not properly installed or do not meet the system requirements may affect system performance or not be recognized by the system. Sewelltech has contracted with a custom memory manufacture to give you high quality memory, specifically designed and tested for your Apple product. Each memory module is made using state-of-the-art equipment in Southern California. Unlike some companies, who outsource their manufacturing to the lowest off-shore bidder. You have the absolute right to use compatible Sewelltech Memory modules in whatever brand computer or electronic device that you own, and it will not affect your warranty. If you’ve ever heard that you must use OEM memory to maintain your warranty, then you’ve encountered the biggest myth / lie in the computer industry. Since 1975, U.S. law has made it illegal to require purchasers to buy accessories from the original manufacturer to maintain their warranty (with some very limited exceptions). Popularly known as the Magnuson-Moss Act (after the two sponsors in Congress), the Act is designed to prevent manufacturers from over-reaching by “tying in” support and preventing consumers from having economical choices for upgrades. All memory products from Sewelltech come with a Lifetime warranty. If a memory module ever fails we will replace it no questions asked.